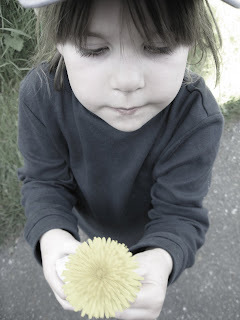 Desiree picked a daisy for me. I smiled largely, thanked her and carried it around while we looked at lemurs and jaguars and wallabies at the zoo. At the squirrel monkey cage I was overcome with a temptation to hand over the daisy. The tiny palm of a squirrel monkey grasped the daisy and then he bounded off with it. Within moments the squirrel monkeys were fighting over the daisy and eating it. Suddenly I realized that I had broken the rule written clearly on the cage: "Do not feed the animals". In my defense I hadn't known I was feeding them. I didn't realize they would eat a daisy... As the squirrel monkeys plucked the petals of the daisy out one by one in a "loves me, loves me not" way, I turned and saw the tears on my daughter's face. I also didn't realize that I would hurt her feelings by re-gifting the daisy she had given me. I hugged my daughter and told her I had made a mistake -- I shouldn't have given her gift away like that. I dried her tears and asked her forgiveness. Desiree and Daddy went off to get me another daisy while I explained to my son how I had not meant to "break the law of the zoo" and feed the squirrel monkeys or hurt his sister's feelings. oh, this makes me tear up... what a treasure of a daughter you have. what a beautiful mama you are. I would have tried to give the flower to the monkey too, monkeys are distracting like that. They make you lose your mind! The thing I LOVE about children is their gift giving, forgiving ways. What a sweet girl!!!! JoAnn, you're right -- monkeys are so distracting. Kara, thanks for stopping by! You're right -- I think that modelling repentance is a great way to teach it to our kids. Chelsey that was a very sweet post and your daughter is sweet as sugar! This is such a sweet post. I think you dealt with it all so well. Great learning experiences all around!